I’ve read and enjoyed many of Calum Kerr’s flash fiction stories in the past, and I recognise him as a leader in this specialised field, in which I’m now compiling my own first collection for publication later this year. 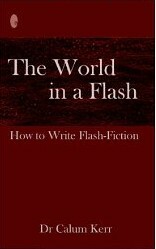 I was therefore very pleased to discover this how-to book to help me fine-tune my own flash fiction writing craft. It is, appropriately enough, a short but comprehensive book, encouraging the aspiring writer to look at all aspects of writing flash and with helpful exercises set along the way to help the reader put them into practice. The last 20% of the book shares a few of Calum’s stories – always worth reading, but here made especially helpful to the learner because he explains how he came to write each one. He also helpfully differentiates between flash fiction and short stories, stressing that many of the same rules apply to both, but making it clear how they differ too. As I also write short stories, this advice was very welcome. An excellent source of inspiration and encouragement to write flash fiction, and to write every day, as Calum does (which is how he is so prolific). His advice is especially authoritative as he so clearly practises what he preaches. Thank you, Calum Kerr. You can read more about Calum Kerr and his work on his website: www.calumkerr.co.uk. And if you’d like to know more about flash fiction and my stories in that genre, please hop over to my Flash Fiction page on this website – new collection coming soon! I have written a couple of Flash Fiction pieces (neither published as yet!) and really enjoyed it. After manhandling a novel being able to knock something of 250 words into shape was wonderful and you really do get to the point where you think there is not another word I would change. That can never be said with a novel! I have recently downloaded one of Calum’s books and look forward to getting to read it. Also looking forward to yours Debbie! Might look into getting this one too – getting the bug for a shorter story!